The Maruti Suzuki WagonR is all grown up now! It is not only bigger, more powerful and more spacious, but also packs many more features than its predecessor. So let us take a look at the major differences between the two and see how far has Maruti’s trusty old workhorse has come with its third generation. The new WagonR is longer than the old car by 56mm and by 19mm than the Stingray, which was later sold as WagonR VXi+. 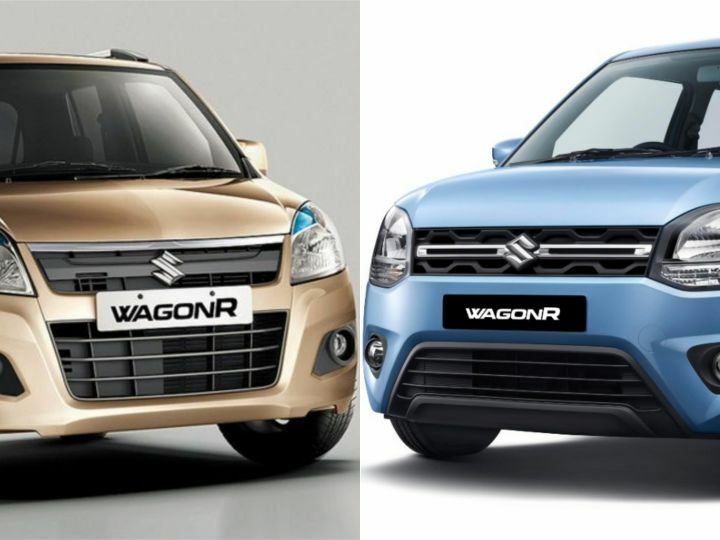 Bigger and bolder is how Maruti describes the new WagonR and it is indeed noticeably wider and longer than the old car. As CV Raman, Maruti’s senior executive director of engineering, explained, the third generation WagonR is 150mm wider and also has a 140mm wider track, which has resulted in a 120mm increase in shoulder room inside the cabin. The tallboy from Maruti is taller now, with a 5mm increase overall. Finally, the wheelbase has been stretched by 35mm. Based on the fifth generation Heartect platform that also underpins the Swift and the Ignis, the new WagonR uses up to 40 per cent high strength steel in its construction and is both lighter (by roughly 40kg) and likely safer than its predecessor. Maruti has redesigned the WagonR with slight scoops around the wheel arches, which give them a flared look. At the front, it gets unique split headlamps but misses out on LED DRLs, just like the outgoing WagonR. At the rear, it retains the old metal nameplate but now features all-new tail lamps that are place vertically (just like the Ertiga) and more Volvo-esque. Sadly, there’s no alloy wheels on offer on any variant of the new WagonR. The 2019 WagonR now gets two engine options: a 1.0-litre 3-cylinder petrol unit from the old car and a 1.2-litre 4-cylinder K-series petrol motor, which also powers the Ignis and the Swift. This motor produces 83PS of power and 113Nm of torque and can be had in the V and Z variants. It is available with both a 5-speed manual as well as an AMT. The old 1.0-litre unit continues to produce 68PS of maximum power and 90Nm of peak torque. However, it can only be had in the L and V variants. While a 5-speed manual is offered as standard, the V variant can also be had with an AMT. Sadly, there is no CNG option on offer at launch this time round. However, Maruti is expected to introduce it at a later stage. Thanks to its lighter design, the new WagonR is also 10 per cent more frugal than the outgoing model. Maruti claims a mileage of 22.5kmpl for the 1.0-litre variants and 21.5kmpl for the new 1.2-litre variants against the 20.5kmpl returned by the old WagonR. Apart from the L and V variants that were offered with the older model, the new WagonR also gets the Z trim level for the first time. There are plenty of updates inside, and Maruti has overhauled the WagonR’s interiors with an all-new ‘x-theme’ design and an all-new instrument cluster. The dashboard gets a smarter finish thanks to a 7-inch SmartPlay Studio infotainment system instead of the normal dual-DIN setup seen on the older car. This isn't the same unit seen on more expensive Marutis, but it still gets Apple CarPlay and Android Auto. The dashboard is reminiscent of the older car, with the circular AC vents at the corners and vertical ones in the middle. It also retains the dual glovebox layout from its predecessor. What’s new is that you now get steering-mounted controls and a touchscreen infotainment with navigation. Rear parking sensors, driver airbag and ABS with EBD are now standard on the new WagonR. Meanwhile, there are dual airbags, rear wiper and washer, and electrically folding ORVMs with turn indicators on the top trims. While the wheel sizes still remain the same, at 13-inch in the WagonR LXi and 14-inch in other variants, there’s fatter rubber on offer now. While the VXi and VXi+ variants of the outgoing WagonR were available with 155/65 R14 tyres, the V and Z variants of the new WagonR are offered with 165/70 R14 rubber. With a price tag of Rs 4.19 lakh, Maruti has priced the base L variant of the new WagonR a mere Rs 4,000 higher than the older model. While it is still competitively priced, the addition of a new top-spec variant and a more powerful engine has made it more premium. With prices going upto Rs 5.69 lakh, the new Wagon R is up to Rs 34,000 more expensive than the outgoing model, which was priced between Rs 4.15 lakh and Rs 5.35 lakh (ex-showroom). I wish maruti brings back Ritz, I am a big fan of it and waiting for it. It can also be modified into a MUV or a SUV, it's definitely going to drive people crazy, it's engine is capable enough to handle more load. I wish maruti brings back Ritz, I am a big fan of it and waiting for it. It can also be modified into a MUV or a SUV, it's definitely going to drive people crazy, it's engine is capable enough to handle more load. Reverse camerais and headlamp is conventional is back this wagon R . Reverse camerais and headlamp is conventional is back this wagon R .
Thank god they widened it. With three people in the back seat, it was even more uncomfortable than an auto rickshaw. Thank god they widened it. With three people in the back seat, it was even more uncomfortable than an auto rickshaw. Is it come with cng ?????? Is it come with cng ????? ?